The Israel Flag is one of the national symbols of the state of Israel. 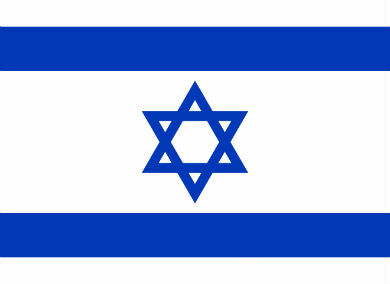 The flag of Israel was adopted on October 28, 1948. The picture of Israel flag consists of two blue stripes on the white background. between two horizontal blue stripes. The Star of David is composed of two crossing equal blue triangles. From the Biblical times the Star of David is a common symbol of the People of Israel. The basic design of the Israel flag remembers the Tallit, which is the Jewish prayer shawl, in white with blue colored stripes. Location: On the eastern coast of the Mediterranean Sea Israel has a border with Lebanon Syria Jordan and Egypt. Area: 20, 770 Sq. km. National Flag: White with 2 horizontal blue stripes the blue Shield of David in the center. Design and Colors A blue Star of David between two horizontal blue stripes on a white field.